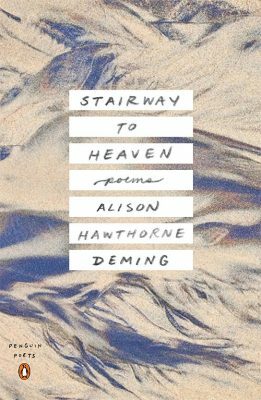 In her fifth book of poems, Stairway to Heaven, Alison Hawthorne Deming explores dimensions of grief and renewal after losing her brother and mother. Grounded in her communion with nature and place, she finds even in Death Valley, that most stark of landscapes, a spirit of inventiveness that animates the ground we walk on. From the cave art of Chauvet to the futuristic habitat of Biosphere 2, that inventiveness becomes consolation for losses in family and nature, a means to build again a sense of self and world in the face of devastating loss. In this splendid collection, the poet is exquisitely attuned to nature’s cycles and the mortality of loved ones. Particularly moving is the poem “The Luminous Mother,” where she prays for the rising atoms of her mother and brother and teaches us how to grieve without losing our sense of awe. There is “no artifice” (to quote her) in these poems, just an ever-expanding curiosity about life on our planet and beyond. Never was a book of elegies so suffused with life as Stairway to Heaven – with life and with the painful joy that arrives in, as part of, an earthly body. Aptly, the book’s title directs us at once toward the place we imagine awaits us after this life and to the actual sky in which we imagine it, even when we don’t believe in any afterlife. What these poems compellingly argue, through their intense presence, is that what we find here, even as we feel ourselves leaving it, is more than enough. These are beautiful poems. They are planetary poems spanning the stretch between mind and cosmos, teasing out how the living things of this world work and why we love them so much. Together they make a book like a rock; you can heft it and put it on your desk and look at it with joy. Voice as “shelter and invitation” – this is exactly what Alison Hawthorne Deming’s voice becomes in Stairway to Heaven. Shelter from the madness threatening all natural gravities; invitation to wisdom and deeper knowing, woven of intricate knowledge and care. This is a book to climb with, again and again. Alison Deming knows more about the world than almost anybody, and thank the stars she’s willing to share her wisdom. I had the chance to read Stairway to Heaven. Oh my sweet lord, what a gorgeous, moving, deep, broad river of a book! These poems, situated in our own creatureliness, are wholly unafraid to engage the complexities of love and grief and survival. A reader can only be grateful. And you will be!